Two King Master Suites! Enchanting Adobe on Quiet Cul-De-Sac. Walk to the Plaza! This Well Appointed Multi Level Home with Two King-Sized Master Bedrooms Has it All! 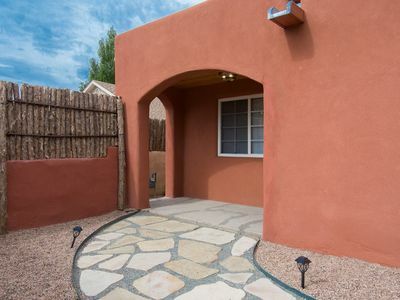 This Charming Adobe Home is located in the Historic South Capitol District, just a short walk to all that Santa Fe has to offer: The Historic Plaza, Canyon Road Galleries, Museums, World Class Restaurants, The Railyard District (with its Farmer’s Market, Shops, Artists Market) and the Cordova Road Shopping Area (including Trader Joe’s) as well as a large Whole Foods Market, nearby. 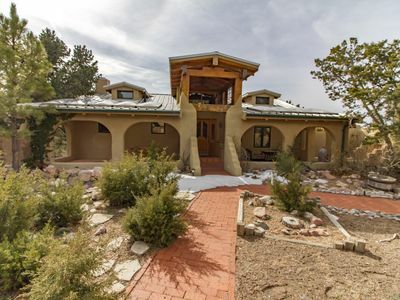 This Spacious 2,100+ square foot home features a Rarity in Santa Fe; Two Beautiful Private Master Suites separated by different levels, Ensuring Privacy for two couples. 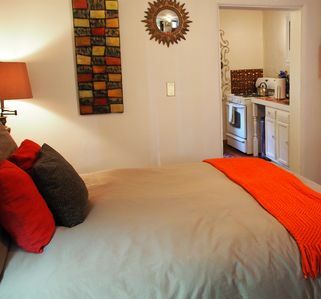 Each suite has a King Size Bed, attached Ensuite Full Bath and Refrigerated Air Conditioning! The upper level King Master Suite features Charming Nooks and Bancos, a Fireplace, Large Balcony and Refrigerated Air Conditioning! Enjoy Upscale Bedding with High-Thread-Count 100% Cotton Sheets, Foam and Feather Pillow Selection, Oversized Luxurious Extra-Fluffy 100% Cotton Bath Towels, a Vanity Make-Up Area, HDTV, and Walk-in Closet! The Lower Level King Guest Master is adjacent to a Private Den & Office area with its own 50” Smart HDTV, and Leather Love Seat, creating the perfect place for winding down at the end of the day, or even getting a little work done! This King Master also has Upscale Bedding with 100% Cotton High-Thread-Count Sheets, Foam and Feather Pillow Selection, Oversized Luxurious Extra-Fluffy 100% Cotton Bath Towels, and a Walk-in Closet. It also has Refrigerated Air Conditioning! The main-level Living / Dining / Kitchen features an open concept floor plan. 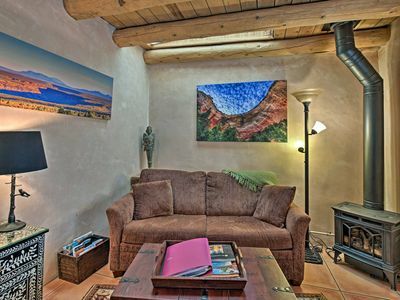 The Living room has been Tastefully Furnished by an Interior Designer with Comfortable Seating, Original Artwork, Bancos, a Traditional Kiva fireplace, Large Smart HDTV and Refrigerated Air Conditioning! 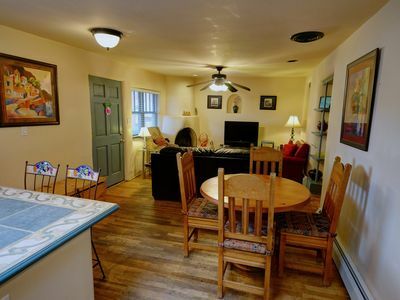 The Charming yet Functional Kitchen has new Stainless Appliances, Extensive Cooking Utensils, and Cookware. This Main Level is the perfect setting for entertaining! A few steps down from the main level, leads you to the outdoor Private Walled Flagstone Patio Featuring a Delightful Water Fountain, a comfortable Sitting Area, Fire-Pit, Gas Grill, and Beautiful Landscaping; just the place for morning coffee or an afternoon glass of sangria. Relax in this Enchanting Courtyard, at the end of the day, as you wait for one of our World-Famous Sunsets! 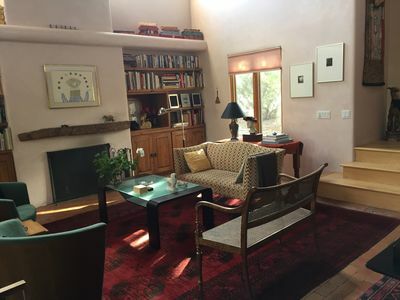 Custom Touches in this home include all of the things that make Santa Fe such a Charming and Romantic place to visit: Beamed Ceilings Throughout, Latillas, Wooden Floors, Hand-Painted Mexican Tile, Private Flagstone Patio and a wonderful collection of Original Southwest Art. Artfully decorated by the owner, an interior designer, the furnishings are top-rate. The owners have tried to think of Everything to ensure that your stay will be Memorable and So Much Better than any hotel can offer! 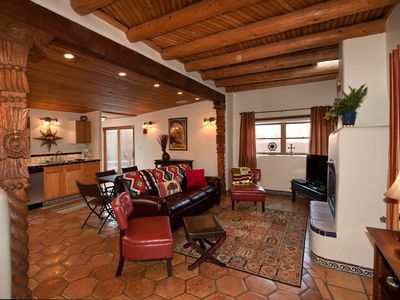 Make Casa Tranquilidad your next Santa Fe Getaway! "This town home was exactly that... a home. 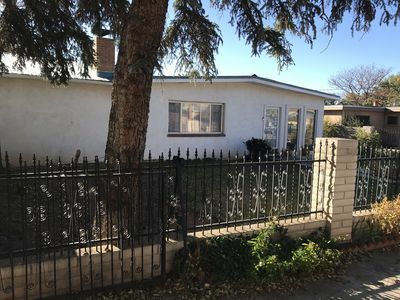 This property is on a quiet and peaceful cul-de-sac and is convenient to shopping (both in the historical district and in town) and unbelievable restaurants. The home was immaculate and impeccably decorated. The amenities make this property desirable...the fully stocked kitchen, large comfortable rooms, and relaxing on the patio is a must! The neighborhood had such a welcoming feel, again, this location is prime. The owners made sure we were comfortable and had everything we needed. 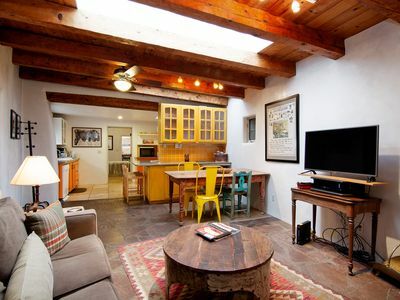 I would encourage anyone planning on visiting Santa Fe to experience this town home. I would return tomorrow!" "Absolutely beautiful. Clean and tasteful decorations. Will stay there again for sure!" 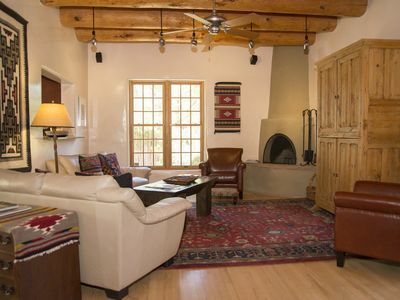 "Perfect base for a week of Santa Fe and environs exploring. Ideal layout for two couples. Well equipped kitchen for occasional eating in and breakfasts. Traditional fireplace was put to good use on chilly mornings and again in the evening. Added so much to our vacation!" 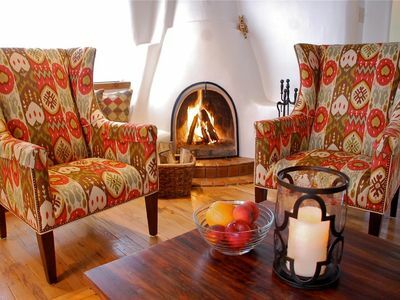 "We were so pleased with our vacation in Santa Fe! To say this home was beautifully decorated does not give it justice. Every place you looked had an interesting southwestern piece of art, Native American pottery, colorful table linens; it just goes on and on! For two couples, it was perfect, as we each had our own private spaces. We enjoyed the outside patio area with the fire pit for cool afternoons and the kiva fireplace inside for cool nights. The neighborhood was very quiet and in a great location for quick trips to stores or nice walks to the plaza. We would highly recommend this property!" "The place lived up to the reviews. It was very clean, beautifully decorated, large rooms, large courtyard, everything and more you would need in a kitchen. Very comfortable beds. We only walked to the Plaza once, chose to drive the other times. It was probably a 20 minute walk. I would love to stay at this place again and it makes me want to use this service again in other cities. I highly recommend this property. We ate at Geronimo, The Pantry, Cafe Pasquals, Chris's Cafe and the rooftop at La Fonda." "This property is three stories with the middle story being the main living dining and kitchen area, the top and bottom floors being separate master suites. Parking allowed one reserved and one street parking and there was never an issue. It’s fully equipped with anything you might need and the management was excellent." "This is an excellent rental. Exactly as described. 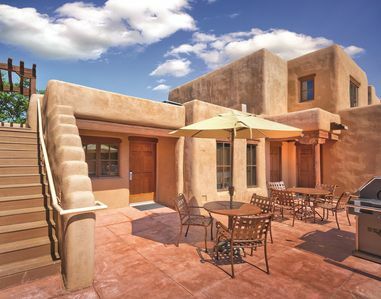 It made our stay in Santa Fe a real joy!" The Quintessential Santa Fe Haven! Perfect Location! 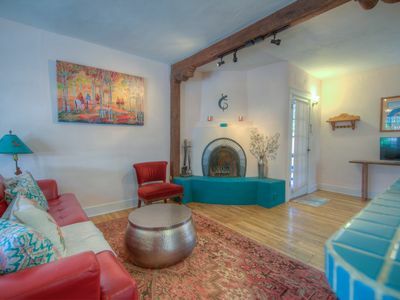 "I had a great time with friends at this fabulous cozy retreat. Although I felt right at home with all the familiar and lush amenities. I felt greeted and surrounded by everything Santa Fe-ish. From the beautiful art, and architecture, to the gorgeous courtyard. It was nice having all the shopping and restaurants within walking distance, and then coming back and relaxing on the beautiful courtyard drinking a glass of wine. Ahhh, it makes me wish I was there now, instead of having to reflect in this writing. It was truly a delightful and relaxing experience." Spectacular and Cozy! Perfect Tranquil Retreat. Ideal Location! "My wife and I spent our honeymoon at Casa Tranquilidad. In one word, our five night stay was fabulous! The setting is ideal. Quiet, tree-lined street with everything in full-bloom. 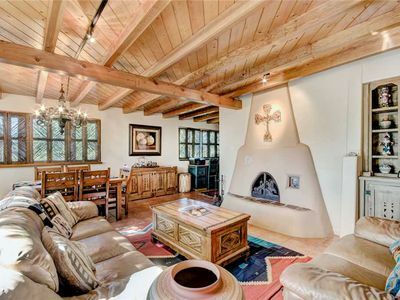 Private, brick-paved courtyard with a gurgling fountain accents this charming, traditional adobe home. 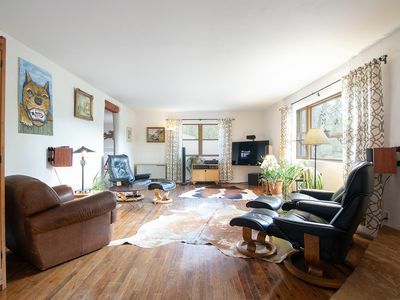 The understated luxury of the home is warmed by natural sunlight. Well-appointed, traditionally modern furnishings provide a feel of comfort and warmth. State-of-the art appliances highlight the open concept kitchen and the dining table easily accommodates four. The master bedroom has a fireplace, sitting area, private balcony with outdoor seating, full bath, and a huge walk-in closet. The king-sized bed with oversized pillows, down comforter and 1200 thread count sheets compares only to what one would find at the most expensive five-star hotels. 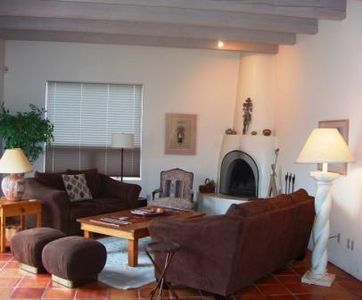 The home about a ten minute walk to the Historic Santa Fe Plaza. We loved this home and look forward to staying there again on our next trip." Peace, Charm, & Enchantment--Expectations were Exceeded! "What an incredible place to not only keep you in the right mood for Santa Fe, but it encourages you to experience as much as possible. Even with 2.5 days of our 4 days spent in rain we believe this was an exceptional trip in which Casa Tranquilidad contributed in part. 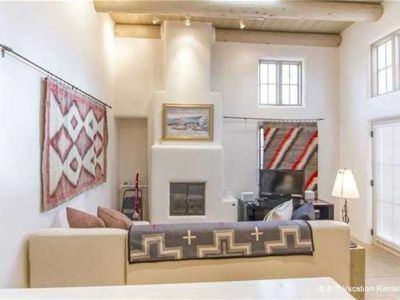 The warmth of wood floors, wood ceilings, kiva fireplaces throughout, water fountain, private outdoor patio, and all at the end of a dead end street with no traffic. We did not experience the walking distance to the Plaza due to the rain, but it would probably take about 20 minutes. 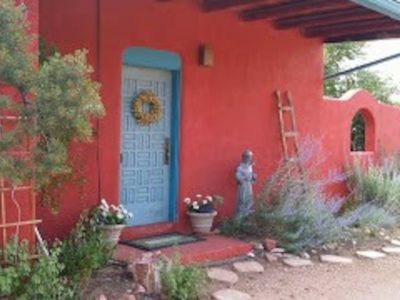 We have enjoyed Santa Fe for the past 30 years and Casa Tranquilidad is one of the few that we would go back to and stay again. 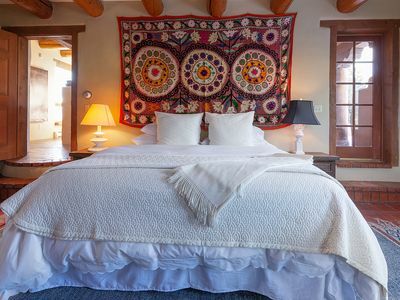 We have stayed in the best hotels and some exquisite homes off of Canyon Road, yet this place was incredibly clean, quiet and magical with good separation between the 2 well-appointed bedrooms for privacy." 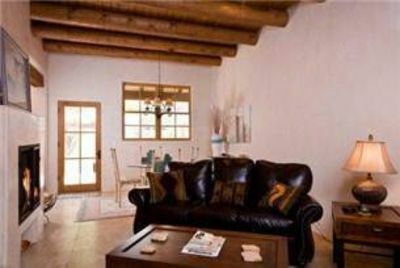 "We enjoyed our stay here very much and would not hesitate to use it again next time we are in Santa Fe. The pictures and the description of the home were spot on - no surprises. Not only was the house accessorized nicely, it had lots of nice touches to boot - things like hangers in the closets, coin trays in the bedrooms, good shampoos and soaps, necessities in the kitchen such as spices, sugar, coffee filters, etc. It was pretty much like being home. We never tried to walk to the history Plaza from the house, but it would have only been about a 15 minute walk at the most. Great TV's, pleasing decor, comfy beds. 100% satisfied. Thank you." Comfort in the country, Santa Fe County.